14ymedio, Marcelo Hernandez, Havana, 13 December 2018 — The builders dismantle panels, pile up fragments of the flooring and begin to remove the screws that connect large areas of the stands. The work is taking place inside the Kid Chocolate Room, in front of Havana’s Capitol building, a venue that until recently served for boxing, indoor soccer and judo tournaments. It is the end of one of the most important sports competition venues in the city. 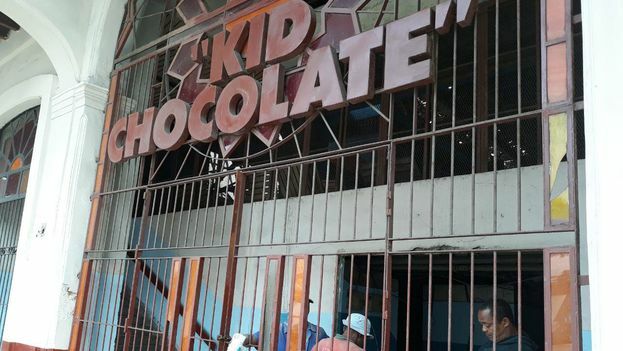 Now, the block where Kid Chocolate is located is a construciton site because the Pasaje Hotel will be erected on the perimeter and the entire block, where the Payret cinema is also located, will undergo an intense remodeling. The dismantling of “la Chocolate,” as the place is popularly known, is not a surprise to anyone, due to its growing state of abandonment. Built in 1991 when the Cuban capital hosted the XI Pan American Games, the sports center opened its doors amidst the worst economic crisis the island has experienced in recent decades. After that event the structure began to deteriorate, until it reached a point where the room was no longer safe for the athletes and the public. “It was raining more inside than outside,” recalls a boxing fan who a few years ago got soaked while watching a national match while a downpour fell on the city. The man says that the time of sports venues “at subsidized prices and open to the public” is over and now Cubans live in “the era of hotels for tourists with pools and roofs that have no leaks,” he adds sarcastically. One of the last events that took place in the premises, last May, was the Giraldilla Cup of university football, where several games had to be temporarily interrupted when the players fell as they slid around on the wet floor.